This weekend, the most hotly anticipated museum in America opens to the public. 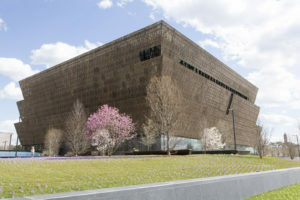 Of course, I’m talking about the new National Museum of African American History and Culture on the National Mall in Washington, D.C. For those of us in the construction industry, the physical creation of this unique building is worth learning from. We were honored to be a part of this project, providing project controls work to the construction team – a joint venture from Clark Construction, Smoot Construction and H.J. Russell & Company. The team brought in Aegis Project Controls even before the project started, so we were able to hit the ground running on day one. With a project of this stature, there was no room for error. The value of project controls, in particular risk management as well as CPM scheduling, were readily apparent on this complex, challenging $300 million project. With a solid risk management plan in place we plan for the unexpected so that projects don’t fall behind schedule. That planning came into good use when it became apparent in the Fall of 2012 that there were significant challenges with the deep excavation due to excessive water. Aegis was an integral part in modeling these intricate delays and working with the builders and the Smithsonian to understand their full implications, and how they affected the overall program schedule. Aegis worked with the entire project team to understand how the revised design would affect construction and more importantly, identifying the opportunities to overcome the potential impacts of the water. Check out the Washington Post’s fascinating story on the architecture of the building to read more about this challenge. This four-year project was incredibly complex, and required people from a range of different backgrounds, including architecture, construction, museums and government to work together. We are proud to be a part of this coalition, which created a historic achievement on the National Mall.